I just returned from a quick trip to St John and Reef Madness and I have a few pictures to share. This is to prove to all the doubters that progress, slow as it is, is being made. The stonework is amazing and I am still in love with this view. As for the concrete, it still is "soon come". 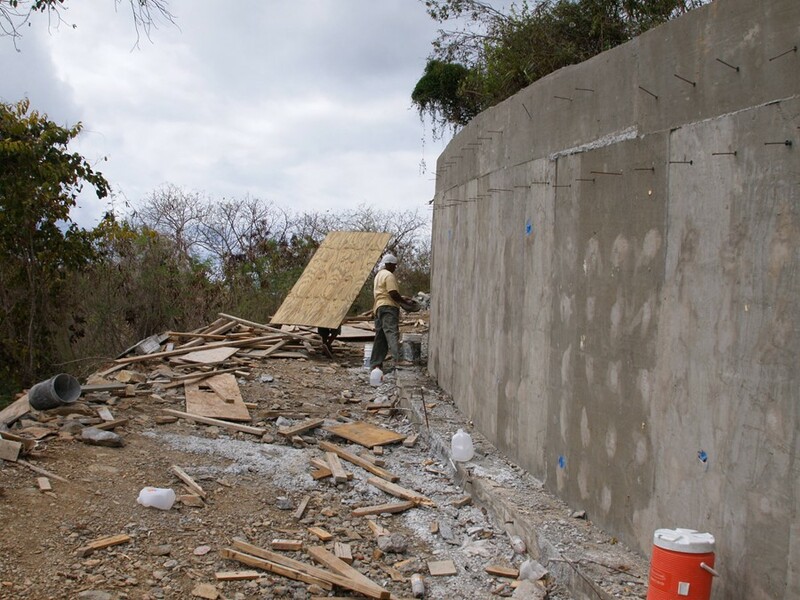 We will feel much better when the retaining wall is completed and the villa is safe. It also will be the last great unknown cost to blind side us. Wait a minute. Who do I think I am kidding. I am sure the Caribe gods still have a few laughs in store at our expense. Imagine if you will an entertainment center in this corner. Flat screen? Of course. Surround sound? Of course. IPOD docking station...yep! Two master bedrooms equal in size and luxury, soon come. Covered stair tower to the very private second floor suite, OK, use your imagination here! Eye level standing inside the endless pool looking toward Coral Bay. So, where do people who live on St John year round go on vacation? New York? Las Vegas? Alaska? My St John builder is on vacation for two weeks. Hopefully work is still proceeding in an island time-like fashion while he is away. So where did Stephen go to get away from it all? Sailing around the BVI’s, that’s where. Hum, I guess to some people “getting away” is merely a state of mind. Here are pictures of Stephen (the Captain) and his lady, Anna (Banana), and the man who does his best to keep Stephen on track, Lewis (Little Buddy), when they all graciously showed me St John from a seaside perspective during a three hour tour on the SS Minnow. 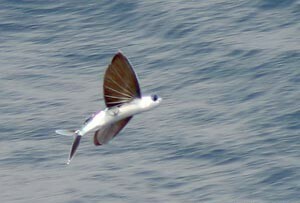 Did I mention that I saw a real live flying fish whizzing past the boat on this day! 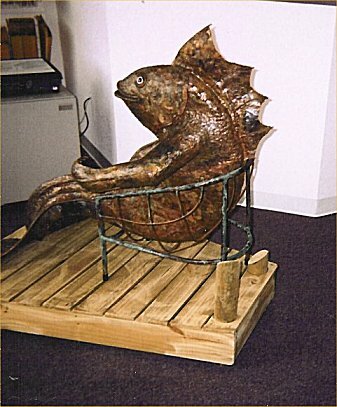 Imagine a fish with wings. 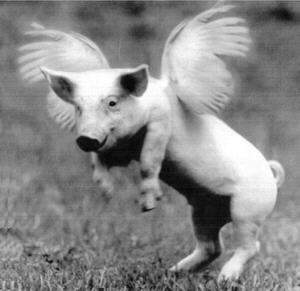 Next thing you know St John will have pigs that fly, and, a building that comes in on time and under budget! That was over 500 years ago. I think Columbus dropped it off in the islands on his late 1400’s "Discover the Americas" tour. Here’s a picture of our tree just before it was harvested. The members of the lumber company family were on hand to bade our cypress farewell. 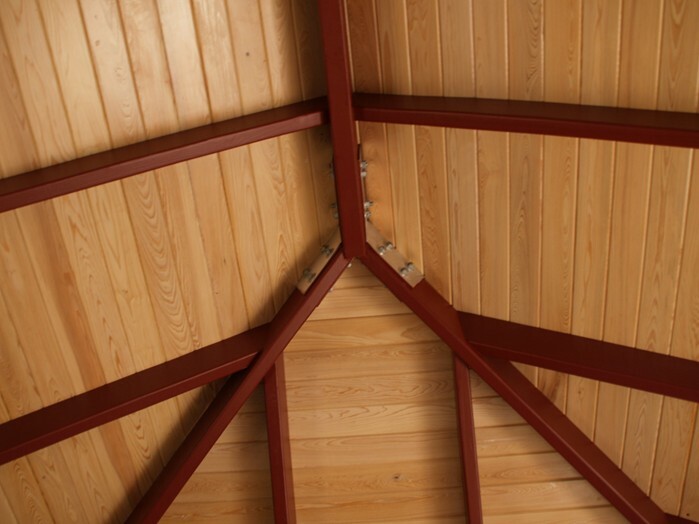 So we have our cypress and we can finish our roof, yes? Well, no. Before the roof goes up, the walls have to go up. Now it seems that the stone masons, whom I have never actually seen working, have stopped working altogether. No one can say why. Was it something we said? Have they been talking to the Caribe gods? What? So now we are replacing them with someone else who may or may not show up. I hear these things happen a lot down here. Island time you know! Too bad, these guys did beautiful work and the job is mostly done. There’s some sort of moral lesson in this random thought: Here I am sitting in an air conditioned office staring at a computer screen all day and dreaming of getting away to the islands. Our stone masons probably dream of being in an air conditioned room and sitting on their butts all day. We have reached a milestone! We just hired a property management company to oversee the rental of our little “Madness”. 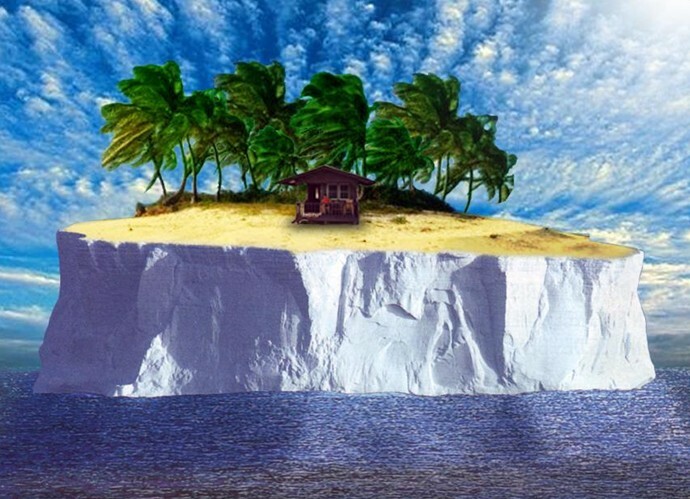 Seems a bit premature seeing that our villa is progressing at an ice age momentum, but we were told, "It's time". 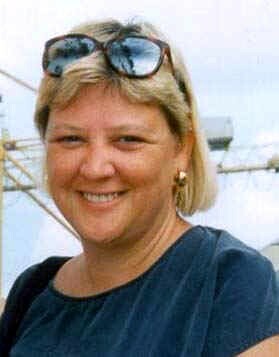 I met with Karin Schlesinger from VIVA Villas on my last St John excursion and I was quite impressed with her. 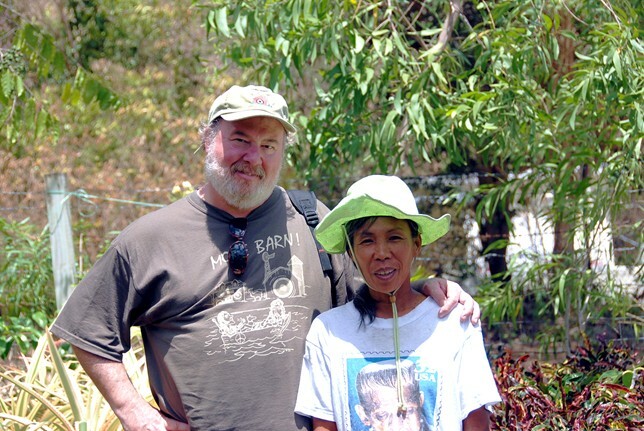 She had some great ideas about improvements we could make as well as strategy for the marketing of our villa. We have to pay for this concrete some way you know. She loved the fact that we are including all this techie stuff in Reef Madness as she is a bit of a techno geek herself! Did I mention that Karin wrote a book about moving to St John? 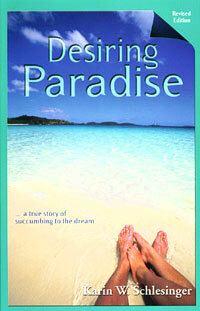 We recently acquired her book, “Desiring Paradise”, and when we get some down time, we hope to actually read it! With all the roof supports, scaffolding, building material, and general madness at “Madness”, one could not walk upright in Homo sapiens fashion and Karin crawled on all fours, around, through, and above the villa like the pro she is, inspecting every inch to see if it was up to VIVA Villas standards. Phew, I think we passed! “Why Coral Bay?” you might ask. 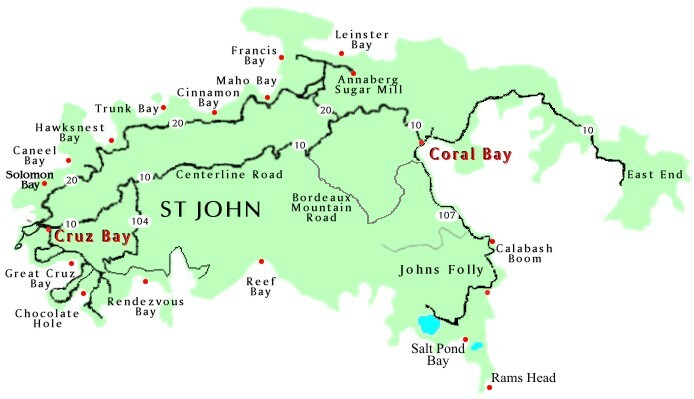 “St John has so many beautiful areas, why did you decide to build Reef Madness at Coral Bay?" Good question. There are no bad places on St John. Every area has its own unique splendor and personality. Cruz Bay is bustling (by St John standards) and for people who want to be close to the action, Greater Cruz Bay/Chocolate Hole is the place to be. Shops, great restaurants, galleries, snooty places (again, snooty by St John’s standards) to see and be seen abound in the greater Cruz Bay area. You can find it all in Cruz Bay, except perhaps a parking place. The North Shore is eloquent and pricey. Many of the “old money” homes are found tucked within the National Park there on the North Shore. This too is where Peter Bay Estates is found, where the nouveau rich hang their ostentatious hats. If I were rich, old or nouveau, I would find my piece of paradise on the North Shore. It is truly spectacular. I believe other parts of the island have more of a local feel because less tourest stay there and it is where most of the locals, the working class, year round St Johnians, live. Why? Because it has traditionally been more affordable than Chocolate Hole and for sure, the North Shore. Sadly, today nothing on St John is affordable for most working class people. 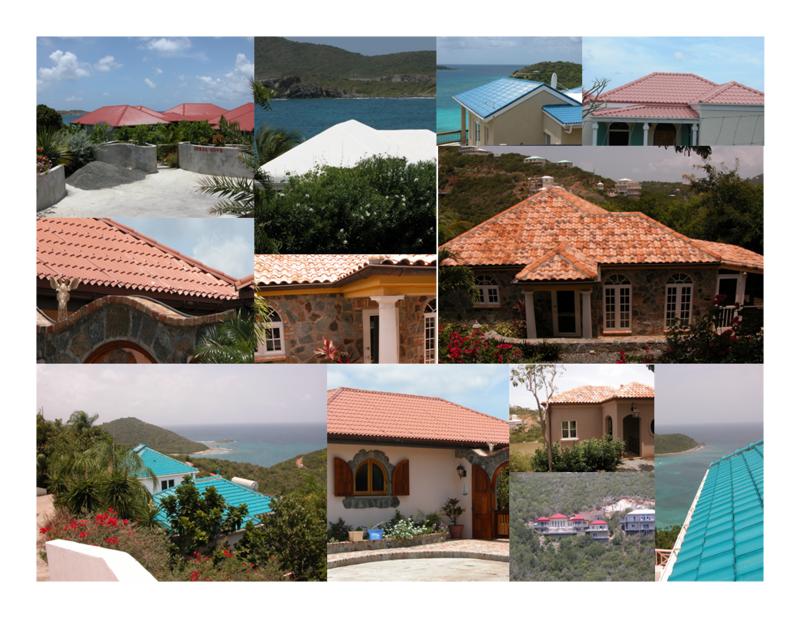 Many people have moved to St Thomas or St Croix for more affordability. Some people without extended family or adiquate retirement income have moved off island when they reach retirement age in order to survive. I am not rich, not poor, but definitely not rich and though I would like to have the quiet magnificence of the North Shore with the convenience of Cruz Bay within my grasp, the North Shore is a tad bit out of my reach. To me, Coral Bay is a perfect fit. Coral Bay, is the “Jimmy Buffet” side of the island, you know, tee-shirts and flip-flops. No pretensions here, though admittedly, pretentiousness is in short supply on all of St John. The East End is beautiful, but a bit far away if one wants to make a quick beer run. The same goes for much of Bordeaux Mountain, Reef Bay, Privateer Bay and other spots removed from St John’s spotty civilization. If I were somewhat more antisocial, and sometimes I am quite antisocial, all these other areas would suit me just fine. But I find Coral Bay Goldilocks perfect. We will be able to roller-skate to Skinny Legs, Island Blues, the Donkey Diner, and Aqua Bistro although the trip back up the hill would be a killer. 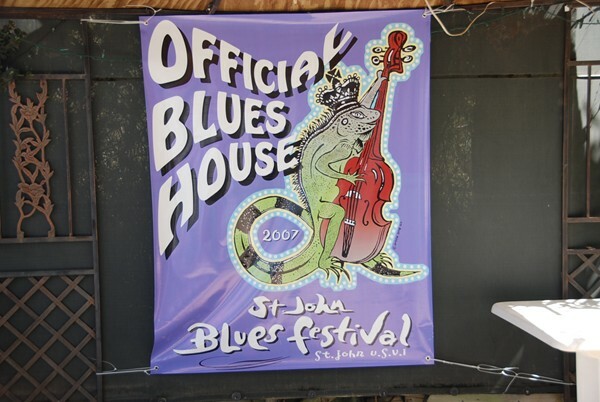 We will be able to hear the music from the Blues Festival below at the Coral Bay Ball Field yet see the stars blazing brightly overhead with nothing to outshine them. Now, where did I put my rum drink! The pickling looks just like ours will look, but our beams will be a deep burgundy and the fans won’t look like propellers off a battleship. We will be traveling to St. John in 2 weeks and rest assured, we’ll bring home numerous images of our Irish pickled cypress ceiling (if it’s actually installed by then). For now, just trust us – it will be beautiful! We are nothing if not optimistic. More rum please! I cannot begin to tell you how we agonized over our roof. We like the look of tile. It has dimension, warmth, and texture. Being from the northern climes, it reminded us of Italy and sunny Spain, exotic and rich. We were willing to beef up the budget to get it. Then we started asking questions. Metal or tile, tile or metal, if you ask ten different people, they will give you ten different opinions. If you go on line you are apt to get opinions based on some not so hidden agendas. Take insurance companies-please (bah, duh boom!). They discourage the use of tile roofs, why? Because they cost more to replace and during high winds, you know, like...say, a HURRICANE, when tile breaks free it becomes a treacherous projectile damaging everything in its path, even innocent bystander houses with efficient non menacing metal roofs! Bad tile roofs! Bad. Bad! Now, you ask a tile company and they will say a tile roof, if properly installed, is stronger than a metal roof and will hold up better, even in high winds. 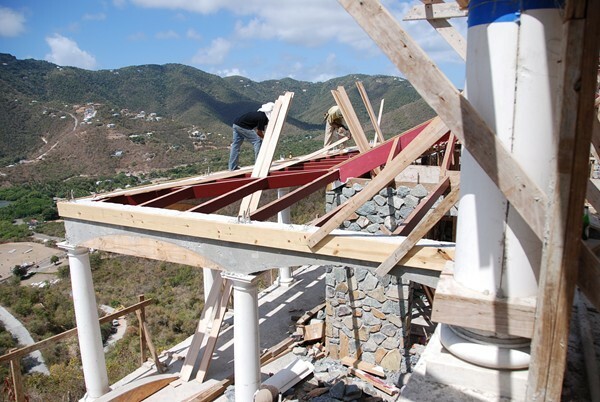 Metal roofers say, “Not so - liar, liar liar!” Jonathan, our architect who has exquisite taste, said “Go with a traditional Caribbean metal roof, which will be functional, wind resistant, and tie in beautifully with the native stone. Be traditional”. 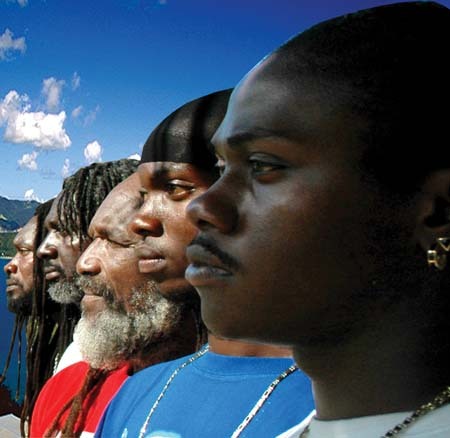 This got me to wonder, OK, what exactly is traditional Caribbean? That, it appears, depends on what island you are on and exactly what point in history you consider “traditional”. Most of the early Caribbean houses were wood, wattle and daub, with thatched roofs. The Spanish introduced the tile roof. It made great ballast aboard their ships. There will be a quiz on this later. 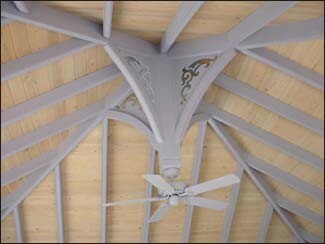 Nowhere can I find an entry for “traditional metal” roofs, but now, it seems as if it is traditional. We spent days looking all over St. John at all kinds of roofs: tile, concrete, metal, metal that looked like tile, tile that looked like metal (I know, I don’t get it either). We took loads of pictures and studied all the nuances of each style, color, and functionality - for as you know the wisest of the wise say “form follows function” (I think it was Socrates or Art Buchwald who first came up with that one). So in the end, putting all the data together, studying the facts without bias, it was clear that metal was far and wide the smartest way to go. So we chose tile. The word of the day is: amenities. By looking at the web page that VIVA set up for Reef Madness you can find a laundry list (still growing) of amenities (toys) that will be available both inside and out. We compiled the list by combining the things that we will want when we’re on-island with the list of things that we think our visitors (meaning: anyone who does not look like us and is staying at the villa when we aren’t around) will want. Naturally, there are a few items that were on both lists, starting with the blender, perhaps the singly most used appliance in any villa. 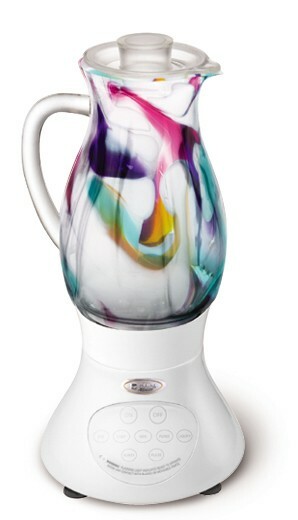 We decided not to have just any ordinary blender, oh no, not us! This thing not only grinds ice, it’s a work of art. Most villa blenders are made by Waring, Hamilton Beach, or Sunbeam. Ours is a Picasso! 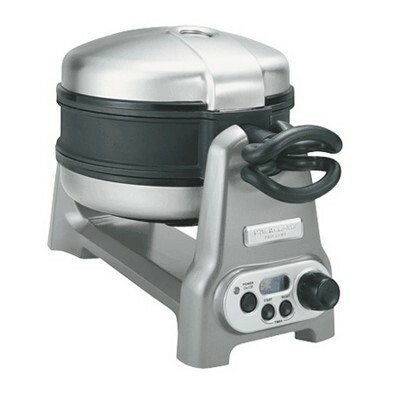 We have a cool Belgian waffle iron that is so huge it can double as a boat anchor. For coffee enthusiasts, we have a coffee grinder to go along with our insulated coffee pot which keeps the coffee warm poolside. You can take it out to the pool for an early morning dip and sip! There was a long discussion thread on the Virgin Islands Online Forum last week about televisions and whether or not you watch TV while on St. John. A lot of folks seemed pretty indignant about ruining the island vibe by turning on the tube. But there were others who admitted that they did take a peek at the TV every now and then, just to wind down from an exhausting day at the beach. As villa owners, we will try to please everyone and as a result, we’re currently shopping for televisions disguised to look like Hawksbill turtles for those sensitive island purists. The one in the main house will be connected to a DVD player and a surround sound system. Island overkill? Perhaps, but we’re hoping that it’s the devilish details like these that will attract a loyal following of repeat visitors (you know, the people who don’t look like us staying at Reef Madness when we aren't around). And if you choose to leave the electronics turned off, more power to you, but please, don’t feed the turtles. On St John, for the most part, the wildlife isn’t particularly wild. Of course it is, but it’s a friendly sort of wild. Many of the local fauna are more then willing to show their best photogenic pose in exchange for a small snack. We learned that all the fur-baring animals on the island are imports (just as we are, lucky them, lucky us). However, many of the birds are local as are the lizards, geckos, and creepy crawly things (see, I know my scientific genre!) The first couple of times on island, we were fascinated by all the goats, deer, cows, pigs, mongooses, and donkeys we saw meandering along the roads. More than that, we marveled at how we hadn’t seen any roadside fur-baring pancakes, despite the way some of the locals enjoy driving. It was on our very first trip that we met what was to become our most favorite wildlife photo-op, the bananaquit. It was on our very first morning, on the deck of our very first villa, tucked inside the National Park above the beautiful north shore beaches, that we first saw this bold and beautiful little bird sitting on the edge of a coffee cup getting a caffeine high. We started to put out a cup every day and got a few feathered Starbuck fans. We then learned that these little guys not only get off on caffeine but they have quite a sugar-jones as well. That led to a bowl of sugar water which would attract even more of these sociable little birds. 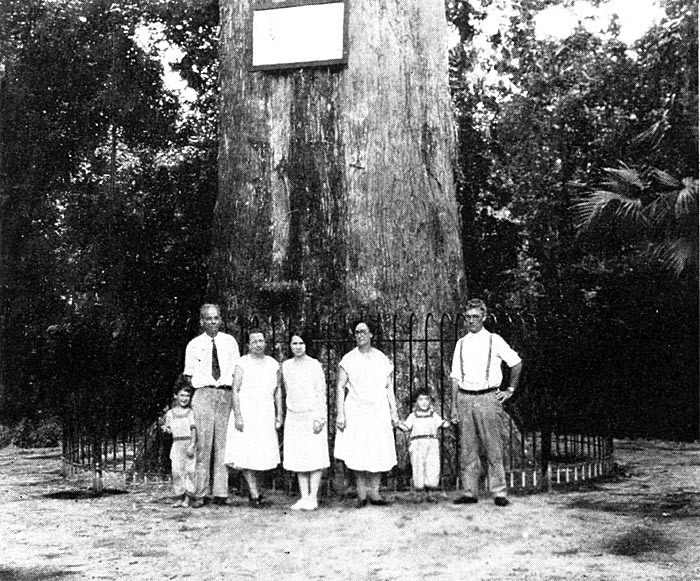 We later had an occasion to visit a home on Bordeaux Mountain where the owners provided 10 pounds of pure sugar on a plate suspended via a pulley system above the surrounding jungle, all day long. They had hundreds, maybe thousands of these little sugar junkies swarming like bees and they were tame enough to eat from your hand. I saw these very cool sugar feeders (pictured below) at Serendip Condos where the on-site manager provides sugar for the Cruz Bay bananaquit population. If anyone knows where we can find some of these simple little feeders (made from halved coconut shells) write us (reefmadnessvilla@comcast.net)! We would love to deploy a couple around Reef Madness. So if you’re stocking up on supplies before a stay here, don’t forget to pick up some sugar! Those little guys put on quite a colorful and vocal show! Today’s entry will be the last one for this week as we are heading down to St. John to check things out bright and early tomorrow morning. Oh yes, it hurts so good! Just how much progress has been made since my last visit? As you might imagine, this is very important to us because we are continuing to “bleed money” and if it looks like no progress has been made, we might need to reassess our options and perhaps fulfill our suicide pact to eat ten Skinny burgers apiece, four Donkey Diner pizzas, six pints of Ben and Jerry’s Chunky Monkey to be washed down with a case of Red Stripe beer and Cruzan rum. After which if we are not dead yet, we must then sprint up Seagrape Hill to Reef Madness, on foot, in the noon day sun! Yeah, that should do it! Actually, we have much business (monkey & otherwise) to attend to, many pictures to take, rumors to hear and start, turtles to swim with, and bananaquits to feed, so hang on for the updates following our return next Monday! There and back again. Sounds like a Hobbit’s tale. This whole process is a big emotional roller coaster ride. We were excited, disappointed, angry, giddy, impressed, depressed, overwhelmed, under whelmed, tired, energized, you name it, we felt it. More to come…or “Soon Come”! Let’s talk about stone. Let’s also talk about stone masons. The natural stone that is seen in the newest and some of the grandest buildings on St John can also be seen in the oldest of the old on St John. This stonework seems to scream “Look at me. 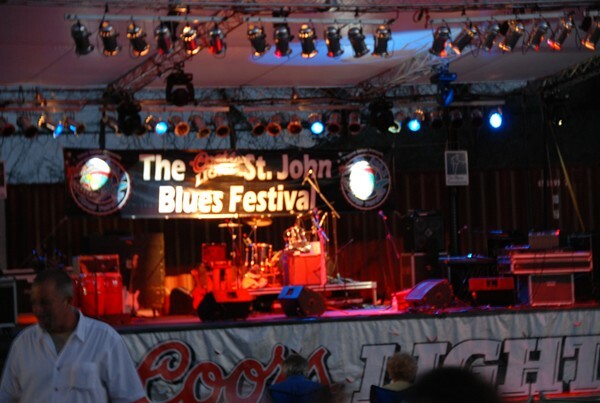 I am part of St John’s culture and history and I am glorious to behold”. I wonder if the settlers of St John had as much trouble with their stone masons as we are having. As you might remember, one day about six or seven weeks ago, our original stone masons started to not show up. They were fired and new stone mason were hired who also did not show up. Now it seems that the original stone masons who did not show up, did not just up and quit, they went on vacation and now are back from vacation! They did not mention to anyone that they were going on vacation. They just stopped showing up. Now six weeks later, they are ready to get back to work! 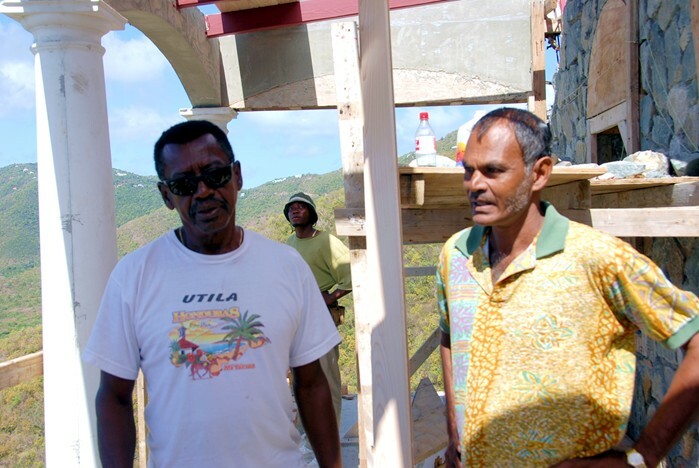 Roy, our construction foreman, says that this happens all the time on the islands. The workers leave whenever they feel a vacation coming on and come back when it suits them and can not understand why we mainlanders get so upset about it. 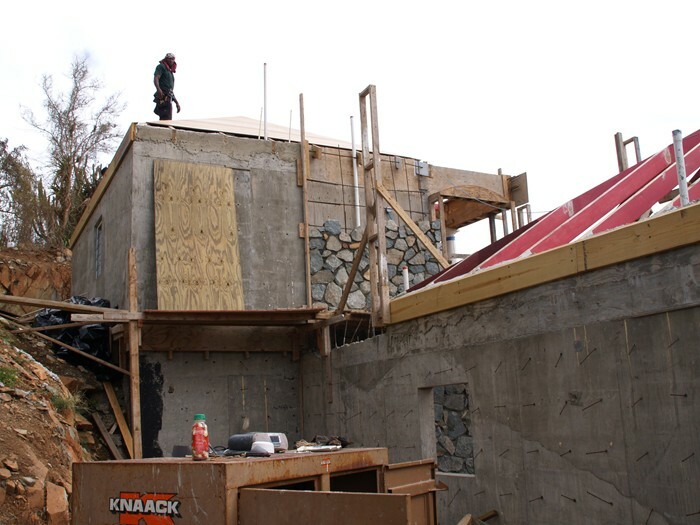 The roof goes on after the stone walls go up; if the walls aren’t up the roof can’t go on and the doors and windows can’t go in and the tile can’t get laid and the…and the…you get the picture. "Island Time", no wonder so much alcohol gets consumed down here. It's West Indian revenge! So the house looks pretty much the same as it looked six weeks ago. I don’t get it. The bills keep coming, but nothing gets done. Yes, we are still bleeding money. The good news, I am really trying here folks, is that the original guys did a great job-when they showed up. We are now hearing “by the end of the week it will be done”; now where have I heard that before! All island stone work comes in a variation of three flavors. 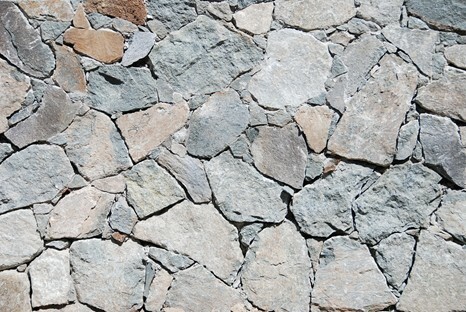 Chinked stone is mortared stone with small pieces of rock, brick and sometimes shells, glass, and bottles mortared in around the larger stones. 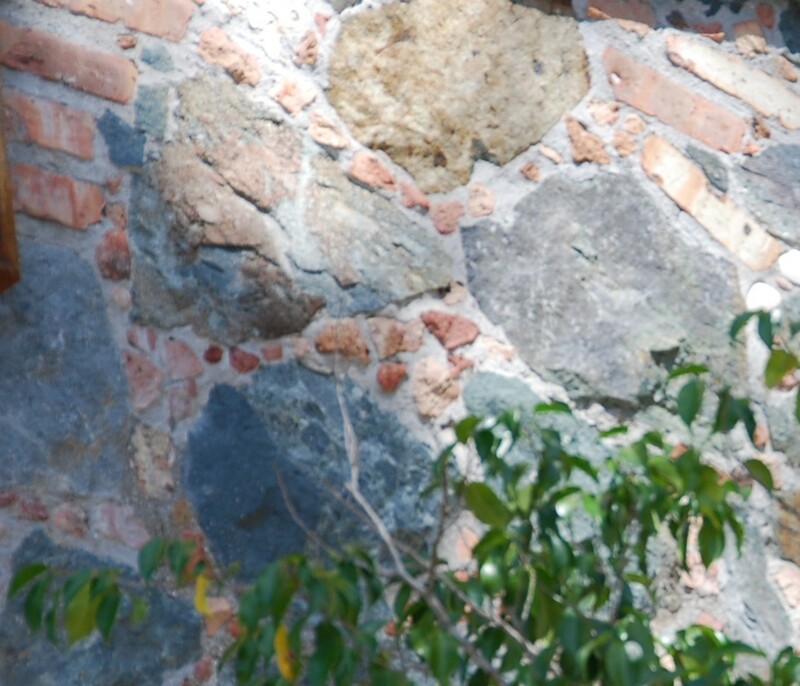 This chinked stonework can be seen in some of the ruins left on the island. The second type is mortared which is the same as chinked without the small pieces added in. The third is fitted stone where the stone is tightly fitted together without mortar on the outside. We’re doing a little bit of chinking on the outside, and mortared on the inside. Here, in the order outlined above, are examples of each. 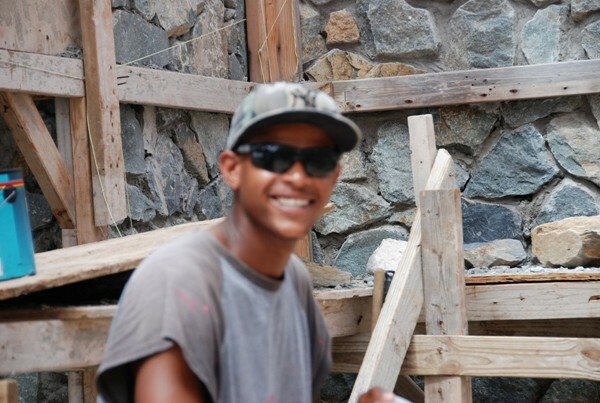 Oh yes, and pictures of our stone masons in case they go missing again, we can put pictures of them on milk cartons! Aside from not having any stone masons, the other holdup has been a cypress shortage. 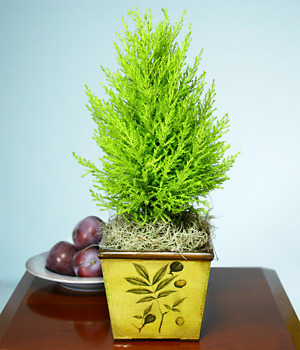 We now have our cypress and have pictures to prove it. Below, the workers (the ones who show up) are shown pickling, sealing, and installing our cypress ceiling. When we first came up to Reef Madness on this trip, I got a sinking feeling in my stomach at the color of the roof beams. 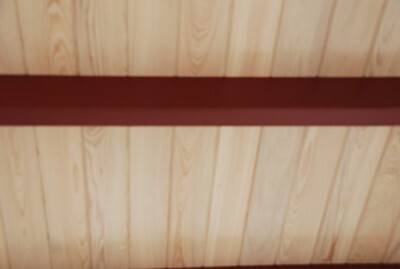 Our burgundy beams were a cheerful looking , dark, Caribbean pink; colorful, but not what we had in mind. After CPR was performed on me, it was explained that this was the base coat not the top coat. The basecoat color had been changed from white to this dark pink color because it took too much topcoat to cover the white. I was able to see the final product before we left the island. In all due modesty, it is AMAZING!!! Roy was not happy with the color of the original pickling product, so he created his own color using watered down white latex paint. We love the final look. 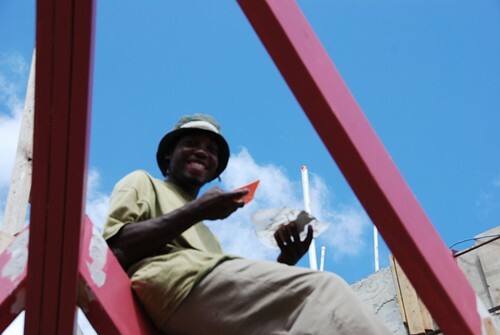 The last picture is of Marlon, a hard worker and the best smile in the Caribbean. Young Marlon always shows up. Marlon, working on a Sunday no less! If you have noticed a difference in the landscape from our first pictures of Reef Madness on Seagrape Hill and more recent photos, aside from the fact the formerly ugly gash now shows a visible structure, you will notice a striking change in the surrounding color. The green foliage of early photos is now replaced with brown and leafless trees going into survival mode. This is because the Caribe gods have seen fit to bestow a draught on our formerly verdant island causing water trucks to be more commonly encountered than concrete trucks. This has been very bad for St John, but very good for Reef Madness. 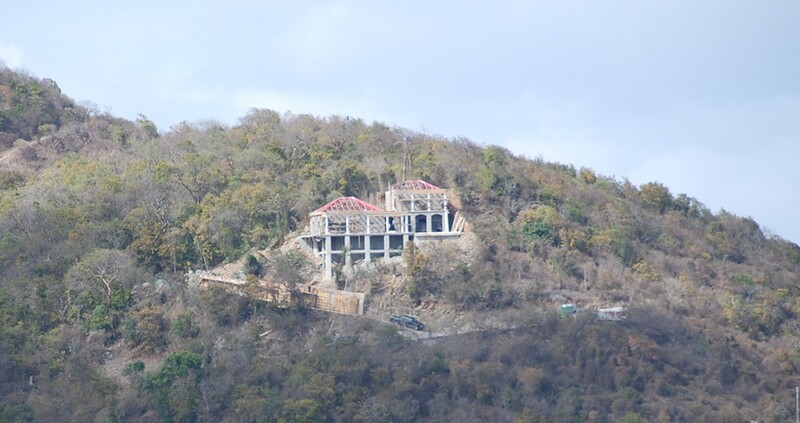 We still have a concrete structure standing proudly on the hillside and not atop Skinny Legs as was our fear when we found out that the hillside could become unstable during heavy rains. With hurricane season right around the corner, how long could our behemoth concrete foundation remain secure? We received some pictures from Lewis this weekend. Our retaining wall has been poured! We have no idea what this massive amount of concrete will end up costing us, but Madness is now secure. Let the rains begin! One ceiling down, one to go! The upstairs bedroom ceiling is pickled, primed, painted, and sealed and it looks great! We decided to seal the cypress which gives it a less rustic, shinier finish, not our first choice, in order to protect the ceiling from exploding fried wontons (see Bongo Bongo Blog #6, November 17th [http://www.bongobongostjohn.com/blog6/] ). We were advised that we can make the villa luxurious and appealing, but we also need to make it “bullet proof”. Bullet proof? Perhaps we should encase the whole place in Kevlar. Certainly there will be some “gotchas “down the road. I mean, how can anyone cover all contingencies? Perhaps someone should start a villa website documenting all the strange mishaps that villa owners have encountered so we can learn from other’s misfortunes. I guess it all comes down to, be a Boy Scout and be prepared…for anything…even exploding wontons. Reef Madness is smaller than it appears from afar. The illusion of its prodigious size is just that – an illusion. So as not to have Reef Madness appear as a concrete behemoth, we thought that some creative landscaping might be in order. We popped over to visit Josephine at the Coral Bay Garden Center while on-island and took her on a tour of an incomplete Reef Madness. Her ideas for landscaping were exactly what we had in mind. She told us what we should try to screen, what types of plants and color would work well and advised us on the size and placement of the water pipes accessing the gray-water system. Way back in the beginning of this project, years and years ago, we were told that we should install a gray-water system for outside watering. Of course, that was discussed with the architect and original owner of Sunnyrock and he is now long gone. Being fat, dumb, and happy, we went blithely along believing we were in fact getting a gray water system and we excitedly told Josephine about it (probably to impress her as to what caring and responsible gardeners we are). Well, we lied. After all the concrete poured for all the stuff that goes under the house (this under the house stuff is why our house looks so huge from a distance: foundation, cistern, pool), no one remembered to put in a gray water system. Can we go back and fix it? Nope. OK Plan B. We are going to have to own up to Josephine about our lack of a gray-water system and hope she has a Plan B. We thought it was time to start another page as this page is going on entirely too long! Click here for the next page! Do you have comments about our Reef Madness?